The oil-field service king doesn’t see a recovery happening in North American activity next year, which is abysmal news for weaker competitors like C&J Energy Services. Schlumberger Limited (NYSE:SLB) has an ominous warning for the oil-field service industry and its investors. When the company peers into its admittedly cloudy crystal ball, it doesn’t see oil and gas activity levels in North American land nor pricing improving at all next year. It’s an outlook that will have an impact on Schlumberger’s results. However, it will be a bigger blow to much smaller rivals like C&J Energy Services (NYSE:CJES). I’m not very optimistic on any turnaround in service and product pricing for oilfield services in North America land. I think many of the small companies or most of the small companies are free cash flow negative. They are under significant financial stress and maybe some of them will go bankrupt in the coming quarters or in the coming year. But there is still massive overcapacity and even these small companies that go bankrupt will likely be picked up other investors and their assets will be returned back into the market. So, I think the overcapacity is going to be with industry for quite a considerable amount of time. So, I don’t expect any real improvement in service and product pricing in the coming year in North America land. While this isn’t a great outlook for Schlumberger because it will affect its business going forward, that impact won’t be as deep as it would be on smaller rivals. That’s due to the fact that Schlumberger is diversified geographically, has a broad product and service offering, and a solid balance sheet. The same can’t be said for its smaller peers, many of whom are solely focused on North American land, don’t have the same breadth of products and services, and, worse yet, have financially stressed balance sheets. Because of these differences, Schlumberger’s outlook should send shivers up the spines of small, North American focused oil-field service companies like C&J Energy Services, its primary shareholder Nabors Industries (NYSE:NBR), and not to mention their even smaller peers. C&J Energy Services, in particular, will have a hard time if Schlumberger’s outlook comes to fruition. That’s because the company took on $1.06 billion in debt in the form of two term loans to acquire the completion and production services businesses of Nabors Industries. 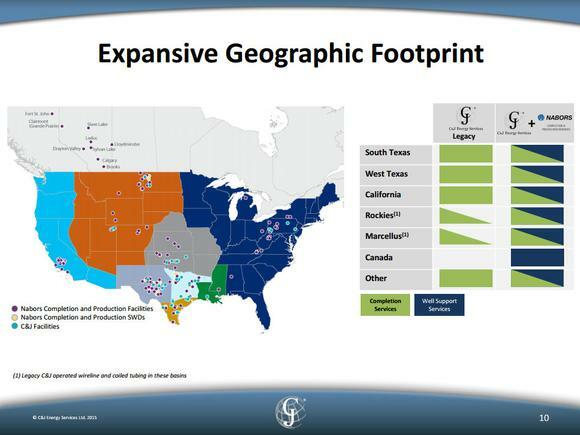 The end result of that transaction saw C&J Energy Services bulk up on its North American oil-field service position, which is seen on the slide below. However, in bulking up the company took on a material amount of debt. That’s is causing some financial stress for C&J Energy Services, which is evidenced by the fact that its banks recently reduced the borrowing base on its credit facility from $600 million to $400 million. That reduction cut deeply into its available liquidity, especially after it had already borrowed $94 million on that credit facility. That leaves the company less financial flexible when it will need it the most. Also not helping matters is the fact that it lost money last quarter, turning in a net loss of $65.1 million. As it noted in its press release, “Second quarter results suffered from continued weakness in demand for our services, with reductions in customer budgets and drilling and completion activity driving severe utilization declines and pricing pressure.” That suffering would continue under Schlumberger’s outlook because C&J Energy Services would face additional pricing pressure within its North American-focused business. It’s an impact that will also be felt by Nabors Industries because of the fact that it now owns 53% of the combined company due to the aforementioned business combination. Furthermore, Nabors Industries boasts of being a leading North American land drilling contractor, which is a business that would also be under pressure next year if Schlumberger’s outlook comes to fruition. Needless to say, it isn’t the outlook either was hoping to hear. Investors in small, North American land-focused oil-field service companies must brace themselves for a tough road ahead in 2016. Companies like C&J Energy Services are losing money and have financially stressed balance sheets. And while C&J’s bankruptcy risk is slim, the same can’t be said for some of its weaker rivals, which could go under next year. The concern is that if those rivals go under, it could pull C&J’s stock price down, leading to a potentially volatile 2016 for investors.